As we all know,trophies or awards are the most popular forms of rewards,to show the appreciation or approval for the receiver.There are many kinds material of trophies like wood plaque, crystal trophies,glass awards ,metal medals and acrylic awards. As to the difference of acrylic awards and crystal awards it would be much easier to distinct them from the weight. Acrylic awards is obviously much lighter than crystal awards. And also when you touch acrylic,it would be not so fragile as crystal awards,it give you a felling of plastic material. Another distinction amond crystal awards, glass awards and acrylic awards is the refraction for light. When light go through crystal, it is prismatically refracted, which refult in sparkling colorful flashes. In the same way,for glass and acrylic awards,they may be be sparkly, but actually they don't have the same prismatic sparkle as crystal. Acrylic trophies can be manufactured in a variety of shapes, colors and sizes. The most common styles are clear rectangular,square or circle plaque,star awards etc. While crystal awards look very similar to glass awards,but they are different. If you note them carefully,you would find that crystal is more transparent, prismatic. While glass awards is mostly clear and also glass is more light in the weight. Basically,some person even can distinct the crystal material by tasting if they are very familiar to crystal. If you lick the crystal ,you would fell it is a little cold if it is real crystal,when glass don't have such feature. No matter for acrylic awards,glass award or crystal awards,all of them can be personalized manufactured by Laser engraving, etching and silk screen printing. Espercially for crystal awards,we also can 3D laser engrave the image,logo,text into the crystal items,which would present a strong 3D impression. 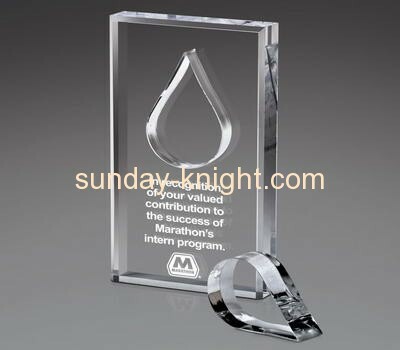 By these technique,these personalized award are more unique and memorial.So whether it is for international competition or small recognition awards, the choice of glass awards, crystal awards or even acrylic awards will result in a beautiful presentation that will be cherished for a long time.